The beginnings of my next quilt, advice on the pattern? Thread: The beginnings of my next quilt, advice on the pattern? I've decided that my next quilt will be for my boyfriend's grandma that just moved to a retirement community. I want to make her a lap quilt. She's Mennonite, so I want to do something that uses a more "classic" quilt block that might be seen in an antique quilt with a modern twist. What do you think of this size? Too big? Should I cut off a column to make it smaller? I usually do at least 3" borders because I do the cheater binding and don't want to cut off any of the pretty blocks. Anyway, tell me what you think! The "stars" in my pattern are where I want to put the pinwheels. I plan on using buttons instead of tying or quilting. I don't know colors yet as I haven't gotten to digging though my stash. Last edited by SemiSweet; 07-17-2013 at 08:29 AM. Reason: forgot the link! 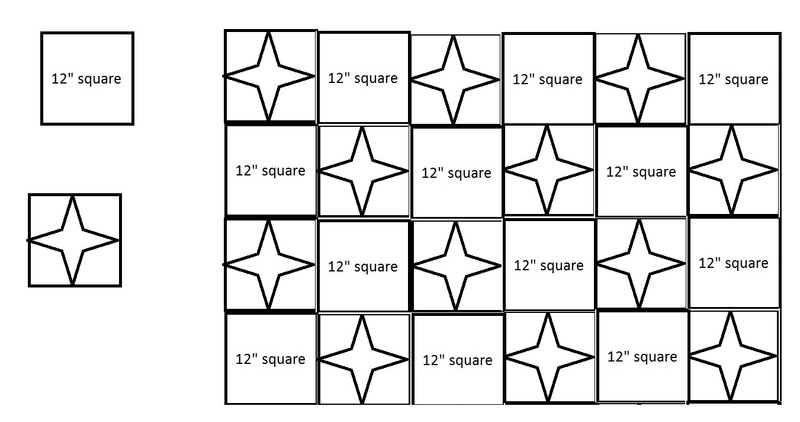 If your squares are 12" that size would be a twin. Five blocks long would be more of a lap quilt size. If your blocks were 8" then your quilt would be only 32' wide. But at 8" blocks you could do four by five blocks and add a border to get the extra width. Going to be lovely - I am sure she will appreciate it! I like to do lap quilts. Usually the quilts end up being around 50"x70". If 12" blocks are used it's 2x3 blocks plus some type of border. If it's on-point, then it's a 2x3 block set with attached border. Good luck. Is she in a wheel chair? Something to consider. Make sure there is a LARGE label on the back in case it " roams". I made for elderly relative it was weight she didn't won't. The pattern is lovely you could put it on point keeping the design. Don't forget to label. My neighbor's niece labels according to the recipient of the quilt. She's very clever how she does it. She will show a small printed label that is stitched on a separate piece of material. Then she stitches along and throughout the quilt other information not noticed by a layman. For a wedding quilt she put the bride and groom's dates of birth then the wedding date around one of the hearts in the quilt. The other information was on an actual label with a pocket insert. no label is the same with her. Good ideas about the labels guys. I'm glad I showed this to you. I think I will label it in a couple of different places just in case someone "borrows" it. Maybe a nice embroidered label in the front and a stitched on patch in the back. I have decided that I will cut off one "column" from my design She's not in a wheel chair, although she does use a cane, so I want to make sure it's not too heavy for her. Do you guys think the regular poly batting I use will be okay for weight? Does cotton batting weigh less or more? Cotton batting is much heavier - think of poly as warmth without weight. When you age and your feet hurt, lighter is better. I don't want to rain on your parade, but that pattern needs some attention after laundry to keep the pinwheels looking decent and nursing home laundries are rough on quilts. Would regular pinwheels with an accent button launder better? When I visit a friend in a nursing home, it's nice to see all the quilts. How very nice of you to do this. Very nice, if the label goes on before it is quilted, maybe it will roam less. I would do a label before quilting. I made a couple for my MIL that walked before I got smart. ALSO, take a picture of it and make sure the staff gets a copy for her file. I put the picture in a word doc (front and back) and tell them the colors and where the labels are. That way if another resident borrows it they know to return it. ALSO, be careful of the fabric colors -- if you are lucky they wash like colors together (and most of it is washed with chlorine bleach). My MIL is in a wheel chair. The first one I made was 36"x48", but that did not work for her. She gave me very specific instructions about the lap quilt. She wanted hers narrower at the top than the bottom and the corners rounded. I used either my sewing machine or later my embroidery machine to embroider her name in large letters in all the borders. I have also made her some soft fleece blankets -- she did not want anything that hung off the bed since the weight was uncomfortable (again she was in bed and I measured what she wanted and made it to her measurements). If your boyfriend has a picture of his grandmother (I don't know what the Mennonite rules are concerning photographs), think about putting her picture as well as a picture of the quilt on the label. That's a sure way to identify the owner of the quilt. I bet she'd love this in 1930s repro fabrics. If she is in a wheel chair or seat most of the time, I suggest making a square or oblong shape that is split down the middle for at least half of the length of the quilt. I saw a few on this board, a little while back,which were called comfort shawls. I think this would be a more versatile shape as she could wear it as a shawl or more easily wrap it around her body whilst in the chair. (It resembles a square "U" shape when finished. lap robe for someome in a nursing home . recently I was told by hospital staff not to use batting for the lap robe, rather a flannel backing . Such as mail, clothing, jewelry, personal items. Having just cleaned out the closet of an elderly lady living in a facility - found clothing that did not belong to her as well as shoes and mail. Thanks for the link -- have been thinking about something like this myself. My idea was a bit more complicated with the same result. Thanks again - now I don't have to re-invent the wheel. This quilt board is great! I have seen many in nursing homes that want a quilt to cover up with when they lay down. I think your size is OK just not the use you were thinking of. Of course folded in half it would be a lap quilt. Just something to think about.